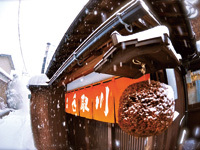 In recent years popular taste in Japan has moved away from the "light and dry" style towards more full-flavored sakes. At the center of this movement have been the brewers of the Hokuriku region, where a cold-weather brewing climate and the local Noto Toji brewing style combine to produce bold, assertive sakes. Within this tradition, Tedorigawa sakes stand apart for their elegance and finesse. The brewery uses Kanazawa Yeast, which has a mild aroma profile with low acidity, often in conjunction with the yamahai brewing method, to produce sakes that have richness and complexity, yet are perfectly smooth and balanced. Tedorigawa's sakes are big on flavor, but never heavy or dense. With the exception of its"Silver Mountain" junmai, which is best savored at room temperature, they are best served crisply cold. Clean, great-tasting and easy to drink, it's no wonder that Tedorigawa is so popular with sake enthusiasts everywhere.